Regarding the work of the Centre, firstly I want to congratulate Dr Diane Heath on the submission of the Gender and Medieval Studies volume on Gender: Places, Spaces and Thresholds to the publisher last weekend. Diane and her fellow editors have done a truly splendid job in record time and they deserve much applause and the deep-felt thanks of the various contributors, including two from Canterbury Christ Church: Dr Leonie Hicks has written the Afterword and I have contributed an article, as has Diane. If all goes well, it will be out in the autumn this year. 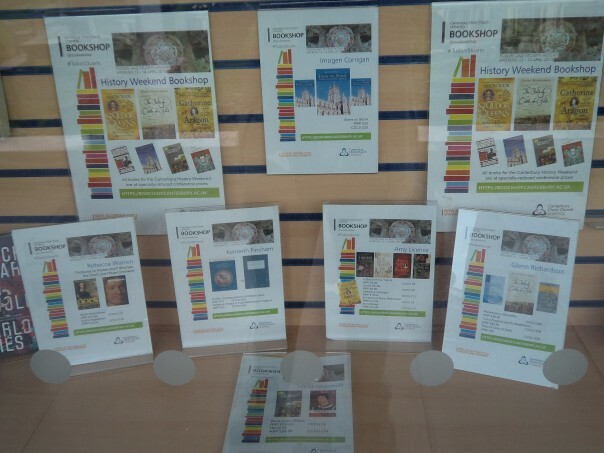 Furthermore, while all this has been coming to fruition, Diane has been working on the ‘Medieval Faversham’ display boards, with Harriet Kersey and me. Due to Diane’s marketing skills, we have an attractive range of themed boards, as well as a timeline and other information that will enhance the Town Council’s new Heritage Hub in 12 Market Street. The idea is to try to finish the designs this week so that we can have them made and ready to go on display in early May. Then it will be a matter of working with the local grammar school to produce materials for Year 7 students to use towards projects inspired by the exhibition. In between working on Faversham and the upcoming Tudor and Stuart Canterbury conference on Saturday 12 May, Diane and I met Lyndsay Ridley from The Canterbury Tales to discuss how we might work together again. For now we are working on organising one or two workshops for Key Stage 2 children to be part of Lyndsay’s Schools Medieval Education Day this September. Della Hooke discusses wild boar hunting. 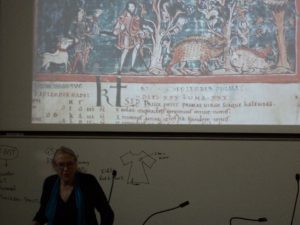 More on these topics anon, but for the remainder of the blog I want to concentrate on the Medieval Settlement Research Group’s Spring Conference on ‘Forest, Woodland and Settlement’ that took place at Canterbury Christ Church last weekend. Dr Andy Seaman, the Group’s treasurer, and a Senior Lecturer in Archaeology at CCCU, had organised a very full programme that began with a guided walk around medieval Canterbury on Friday evening. I joined the conference delegates on Saturday morning with two other staff members from CCCU, Leonie Hicks and Dr Michael (Mike) Bintley, who was one of the afternoon speaker. 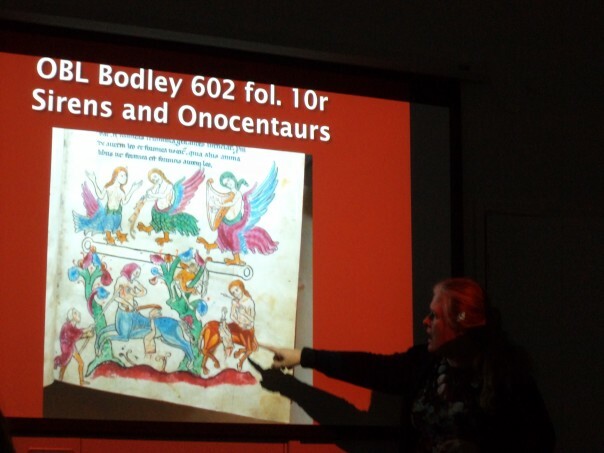 Also in the audience were several of Andy’s undergraduates, as well as Janet Clayton, a postgraduate here who is working on Scadbury manor as a case study to investigate relations between London and north-west Kent in the later Middle Ages for her doctorate. Due to this being the Centre’s blog, I’m going to concentrate on the Kent papers (and Mike Bintley’s ‘reconstructed forest’), but this is not to decry the fascinating talks on medieval hunting lodges and deer parks, the forest as resource in the Midlands, in particular, and a very interesting community project covering the area to the north of Chichester, somewhere I used to know well when I was farming near Midhurst. Gillian Draper considers the role of churches along pilgrim routes. The first session of the day brought together two papers on the Weald, firstly Dr Della Hooke (University of Birmingham) spoke on the resources of the Wealden woodlands and then Dr Gillian Draper (University of Kent) took us along the route ways across the Sussex Low Weald that may have been used by pilgrims heading east to Canterbury. In her presentation Della Hooke discussed the importance of the woodlands as a source of timber for the construction of buildings, as well as for fuel, whether we are talking about billets or the production of charcoal. Such fuel was required for domestic use, but there is the possibility of iron working linked to the Weald even from an early date. This would become far more significant from the late medieval period and into Tudor and Stuart times. For the early period, too, she stressed the importance of wooden utensils during the Anglo-Saxon period. Regarding woodland management, she noted the value of pollarding and coppicing, and that the woodland was a good source of food for livestock – elm, beech, oak and holly, especially for pigs but also cattle and sheep. Finally, she highlighted the value of the Anglo-Saxon charter evidence for such woodland activities. Taking a different approach, Gilliam Draper drew attention to the west-east routes across the Weald and the South Downs and their relation to the old ‘fish’ route from Rye to London via Tonbridge. She explained that the routes and settlements in these areas of Sussex and Kent should be seen as a palimpsest as they developed over time, and that they can be charted using old maps, including the Gough Map, as well the location of holy springs, certain relics, hermits, minster churches, the dedication of particular churches, and the sites of fords and bridges. However, she also pointed out that ancient routes might be disrupted by later changes, as in the positioning of a Norman deer park. 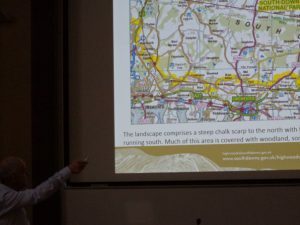 To illustrate some of these factors, Gill first demonstrated the route along the ridgeway of the South Downs before turning to the more convoluted route that ran through the Low Weald and which today is still marked by the A272. For anyone who has travelled along this ‘A’ road will know, there are few straight stretches east of Petworth, the road comprising a composite of lanes and roads as it goes from settlement to settlement. For the medieval pilgrim this presumably had certain advantages in that there were numerous small places, with chapels or churches along the way, but whether it was that attractive for many is very difficult to know and the absence of many stone crosses along the route (Gillian has identified one so far) may tell its own story about its limited popularity. Nevertheless, this route may pay further study and Gillian is intending to take this project further in the future. Mark Seaman points out the area under investigation. 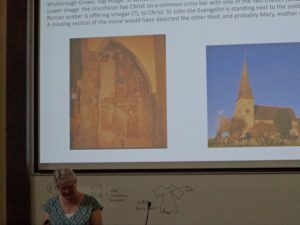 After a coffee break, the audience heard about Dr Paul Everill’s (University of Winchester) project on medieval hunting lodges in the New Forest and Dr Amanda Richardson’s (University of Chichester) related project on perspectives relating to medieval deer parks. After lunch the focus remained beyond Kent, and we heard Paul Everson’s (University of Keele) exploration of forest landscapes in the Midlands, especially there value as industrial spaces – iron-working and glass-making; their role for the provision of hospitality – hunting and enclosed parks; their place as nodal points for trade – marketing woodland products, and their sacred nature – whether we are discussing the Grail Quest or the presence of certain saints’ cults. Mike Bintley’s paper was an excellent foil to Paul’s, for Mike provided some fascinating ideas about the reading of Old English poetry, riddles and theological/philosophical texts, including Beowulf and Bede. He sees these as using the idea of reconstructed forests to denote the community of Christian believers (clerical and lay); the idea of timber – woodenness – as in some senses denoting resilience and restoration, yet at the same time vulnerability, for like the wounded man (warrior) the timber building is open to damage, and thus decay. Mike then discussed the defended town – King Alfred’s burhs, and how these timber strongholds were both constructed of wood (houses) and built through wood (the tools), which means that texts such as the Old English Boethius can be read on various different levels. And to finish, Mike introduced his audience to Old Norse, where the sheer multiplicity of names for timber again highlighted just how complex this topic is when explored in relation to the cultural symbolism of the forest. The final two papers brought the audience back to first Sussex and then Kent by looking at two different community-based projects, albeit both had received Heritage Lottery funding. 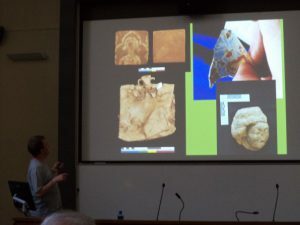 Although both Mark Seaman (Sussex) and Andrew Mayfield (Kent) discussed what their respective groups had found during archaeological excavations, Mark’s focus was primarily the successes and failures of the project as he saw them, while Andrew used his talk to introduce the audience to the Cobham estate, and specifically Randall Manor, the subject of the field trip on the Sunday. Mark’s project was very interesting, but I just want to mention one of the key things I think he mentioned and that was the absence of a clear legacy. For the project has ended and there is no planned follow up. Yes, the volunteers seemingly enjoyed themselves, but the travelling exhibition drew few visitors, doesn’t appear to have inspired a new generation, and the volunteers’ skills were not harnessed during the project and nothing has changed since, leaving many frustrated. In many ways the Kent project has been far more successful in that the professional leader at the beginning – Andrew Mayfield, was still there at the end, and has even managed to secure more HLF funding for a neighbouring landscape project. In addition, the 10-season community excavation did an excellent job of finding the manorial complex based around the aisled hall, as well as exposing the associated fishponds and what must have been a stunning view of the Thames estuary looking north. Andrew Mayfield takes the group up into the chestnut woodland. 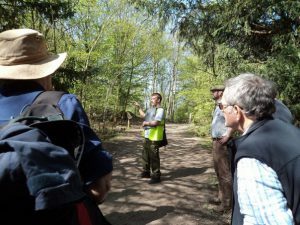 Thus, the Sunday field trip to Shorne Woods Country Park, where Andrew and his team had excavated Randall Manor, was an excellent choice. In addition, we had the opportunity to see first-hand the excellent Visitors’ Centre, which is made of locally-sourced chestnut, the short strips glued together under pressure and thus to a degree resembles plywood. It is a beautiful structure and I’m not surprised that it has won awards. However, turning to the Cobham estate in medieval times, and specifically Randall manor, Andrew took the party through the wooded area of the much later clay pit (the importance and wealth of the Blue Circle Cement works nearby has fundamentally changed the landscape from hill to depression (pit) over a large area) and up into the chestnut woodland. This is not medieval woodland either, but at least the topography has not been drastically altered, and it is within this area that Randall manor once sat. When we arrived at the site of his group’s excavation (now an open glade), Andrew pointed out the relevant features and the positions of the various buildings they had discovered. 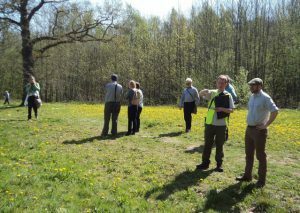 Having had a good look, including the location of the adjacent fish ponds that have also totally disappeared too, the group headed up the slope along an ancient trackway to what had been the manor’s heathland and the site of a medieval windmill mound before returning to the Visitors’ Centre. Following lunch, the group said goodbye to Andrew Mayfield at Shorne, and thanked him for his guided tour. The delegates then headed back to Canterbury, and at Old Sessions the group also thanked Andy Seaman for all his efforts. For as at so many conferences, it is not just the papers and field trips that are valuable, but the chance to discuss issues with those who have shared interests, and for all these reasons Andy should be congratulated for organising such an interesting conference. I agree for the need for a legacy and part of Andrew’s project at Shorne from the outset was to involve the schools and local comminity . Over the 10 years there was a rolling programme of school visits each summer and well attended open days and continuous intent to stop and engage with people passing by In addition Andrew ensured both the local YAC groups were involved on site . A further legacy of the Shorne group was a band of trained volunteer archaeologists that continue to this day to be available to be called upon to assist other projects. Yes indeed the Shorne Woods/Randall manor project has been great for a wide range of age groups, and continues to be valuable as a springboard for the volunteers – young and older whom Andrew and others involved with the project have trained etc. It has been great over the years to see reports about the excavation in the Kent Archaeological Society’s newsletter, as well as excellent 10 days ago to meet some of Andrew’s YAC group.